Amphibious Lambo and Flood-Powered Trash Can were just the beginning. It’s time for El Niño: The Reckoning. A nasty set of El Niño-powered storms thrashed the West Coast over the weekend, confirming predictions that a “Miracle March” might deliver the promised gut-punch of rain and snow that the region desperately needs. The good news: The “atmospheric river” jetting in from the Pacific this weekend was cold enough that moisture from the storm fell as snow, not rain, dropping up to five feet of snow in some parts of the Sierras. The resulting blaze was hot enough to melt the electrical wires above the tracks. Amazingly, the train was re-opened in time for the Monday morning commute. But trucks weren’t the only things burning in LA. The tail-end of the system whipped through the city early this morning, rousing Angelenos with end-times thunder that set off car alarms and lightning that ignited local foliage. 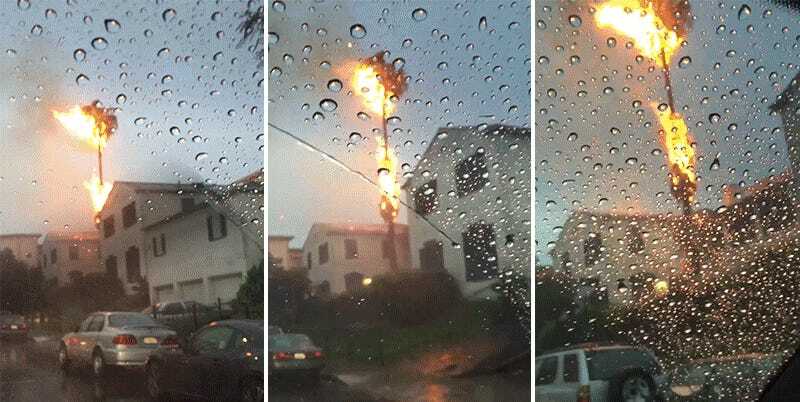 As for the fiery tree (which is actually kind of a common thing during LA’s rare thunderstorms), perhaps it is still burning even now, an eternal flame over the city that will serve as a reminder of all that El Niño hath wrought. Get those camera phones ready, there’s more rain on the way.